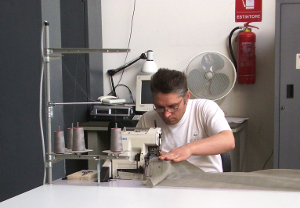 We are a company with 65+ years expertise in textiles and textile machinery. Our skills merge Italian textile tradition with innovation and research on Electronic Textiles. We proudly develop and build 95% of our machines. Since 2000 we have specialized in knitted metal fabrics. Our product range includes: fabrics for architecture, interior design and fashion and EMI shielding. Our products are entirely designed and manufactured in our factory in Florence, Italy - using proprietary technologies.